2 by 3 Heroes: Umm......guys? See? I finally picked up a pack. This makes me cool too. Right? Cuz now I have some 2016 Topps of my own? I just picked up a pack this morning at WalMart. Can I come back into the club now? Oh com'on guys - please? Let me back in. I promise I'll get a pack of Gypsy Queen on the day of release. There's my one pack. Even in hand it still looks like crap. And I get zero White Sox and a frigging Dodger hot pack. And maybe I got the worst card of the set, but Perspectives is crap. The font is from a bad sales flyer for a bedding wholesaler. At least you posted a great song. The Molitor and Yount card is nice. 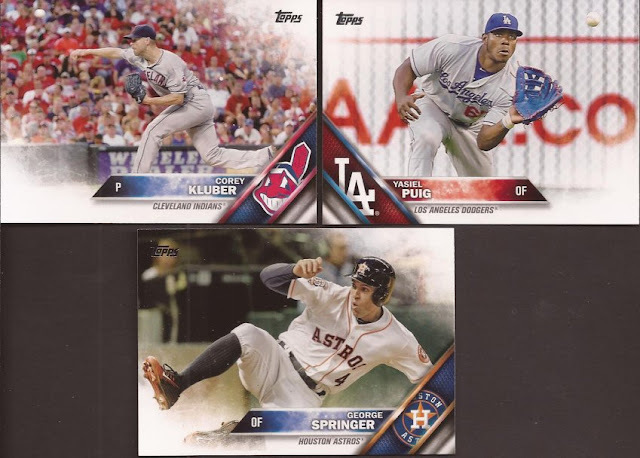 i'm sending you a pwe today with the 2 sox i got in my lone pack of 2016 topps. the pack i bought also had the ethier, but i could use the puig. I still haven't joined the club. Had the opportunity yesterday... but ended up buying four discount blasters (Archives, Stadium Club, and Ginter) instead. One of these days... I'll finally pick up a pack or blaster.